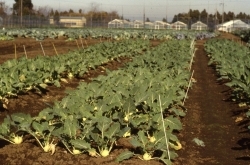 Oregon is home to many fresh market vegetable farmers growing a wide range of vegetable crops for wholesale and retail markets. This site aggregates information relevant to this grower group. Search below by topic and crop for research reports, extension bulletins, vegetable production guides, videos and webinars. Peas in eastern Oregon are grown in the Blue Mountain area east of Pendleton to Milton-Freewater, mostly as dry-land production in rotation with wheat. More recently production has also been in the Hermiston area where soils may be more sandy and subject to wind erosion. Hermiston area production may be irrigated or non-irrigated. Herb production may be for culinary purposes (food flavoring), for scents and fragrances (potpourris), for medicinal uses or others (dyes, dried floral arrangements etc). Herb producers often grow for all these markets, and some herbs may be used for all these purposes. Some of the most popular culinary herbs grown commercially and by home gardeners and hobbyists are: basil, cilantro (coriander), chervil, dill, oregano, mint, parsley, rosemary, sage, tarragon and thyme. Note: This file contains only information specific to production of pearl, set, and boiler onions. For more information on onion culture, refer to the files Dry Bulb Onions -- Eastern Oregon and Dry Bulb Onions -- Western Oregon. Onion bulb size is influenced by a number of factors. Variety, plant density, photoperiod, and temperature are several important ones. Note: This file contains only information specific to the production of green bunching onions. For more information on onion culture, see the file Dry Bulb Onions -- Western Oregon. This guide contains information on mustard grown for greens and on condiment mustard. General information on condiment mustard types and varieties is at the end of this guide while specific comments on condiment mustard production are identified seperately in the sections below. Note: The information in this file is specific to production of garlic for planting stock, as suggested for growers producing garlic for the dehydration industry. More information on garlic types, cultural practices, and pest control can be found in the file Garlic. Endive (curled, deeply cut, leaf types): Green-curled: Lorca, Ruffec (resists cold and wet conditions), Salad King. For trial: Large Green-curled White-ribbed, White Curled, Frisan, Wallonne Frisan (resistant to low temperatures), De Meaux, Crispy Green (heat resistant). "Baby" endive: Tosca. For trial: Galia. VARIETIES (approximately 100-180 days from transplanting). Note: This file contains information specific to pickling cucumbers. For more detail on cucumber cultural methods, including fertilizers, pollination, and pest control, see Slicing Cucumbers. VARIETIES (approximately 75 days for early varieties, 90 days for mid-season, to over 120 days for late large-headed varieties). Broccoli, also known as Calabrese in England and much of Europe, is closely related to cauliflower, cabbage, brussels sprouts, and kohlrabi. There is considerable confusion in the scientific and lay literature regarding exact nomenclature. All these Brassicas will intercross readily and are classified in the same genus and species. Arugula (arrugula) is a tangy mustard green, also known as Rocket, Mediterranean Salad, Rucola or Roquette in Europe, also as Gharghir in the Middle East. Arugula is now popular as a gourmet salad green. Arugula, Rocket, Roquette. For other greens see separate file Mustard Greens. All are quick to mature (approximately 40-50 days). Last revised February 3, 2010. Note: This file contains only information specific to production of sweet corn for fresh market. For more information on sweet corn genetic types and isolation classes, cultural practices, and fertilizer needs, see the file Sweet Corn for Processing.